Paulist Fr. Stuart Wilson-Smith is a native of Eastern Canada. He was born in Nova Scotia and grew up in Fredericton, New Brunswick. He earned his bachelor's degree in history from the University of Toronto. Prior to joining our community, he worked as a musician and in music stores. He entered our novitiate on August 27, 2011, and made first promises to our community on July 28, 2012. During his seminary years, he was active at the Cathedral of St. Matthew in Washington, D.C., notably with the Landings ministry for Catholics returning to the Church after a time away. He made his final promises on Sept. 2, 2016, and was ordained a transitional deacon on Sept. 3, 2016. In May, 2017, he received a Master of Divinity degree from The Catholic University of America in Washington, D.C.
Fr. Stuart was ordained to the priesthood by Bishop Gerald Kicanas of Tucson, AZ, on Saturday, May 20, 2017, during a Mass at our mother church, the Church of St. Paul the Apostle, in New York City. He celebrated his Mass of Thanksgiving ("First Mass") on Sunday, May 21, 2017, at the 5:15 p.m. Mass at the Church of St. Paul the Apostle. In his first priestly assignment, Fr. 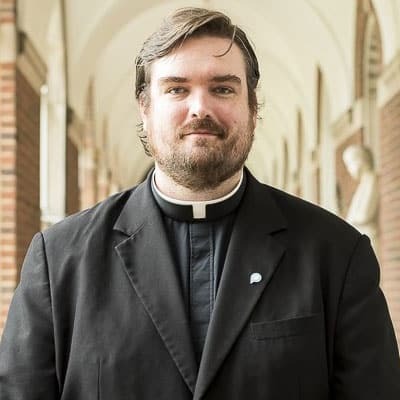 Stuart is serving as a campus minister and associate director at the St. Thomas More Newman Center at The Ohio State University in Columbus, OH. "Though I was baptized Catholic, and attended Sunday school throughout my early years growing up in Fredericton, New Brunswick, I was also exposed to various expressions of Protestantism. As I embarked on a spiritual and intellectual quest in my teens to find where God was calling me, I found myself to be Catholic all over again and became eager to spread the joy and the sense of peace the faith had brought me with others." To learn more about Fr. Stuart, visit his profiles on Twitter, SoundCloud and Pinterest. Read an article about Fr. Stuart written just before his ordination.